Createspace Independent Publishing Platform, 9781478193777, 302pp. This book presents the core principles of Viktor E. Frankl's Logotherapy, and outlines how Logotherapy can be used in conjunction with other forms of interventions. It illustrates that, beyond a philosophy, Logotherapy is also a theory of personality, and a form of therapy. The book aims to illustrate the inductive and deductive interplay between theory and practice. Volume I is devoted entirely to Logotheory. Volume II contains the chapters which portray the practical applications of Logotherapy. Each chapter ends with Points to Ponder, which aim to bridge the chapters, and to highlight connections between theory and practice. The Appendix is written in the form of a Study Guide, expanding on Logotherapy's applications in specific practice areas in line with current developments in mental health care. Corresponding to each chapter, the References section provides an extensive list of relevant sources, and related, up to date bibliography. 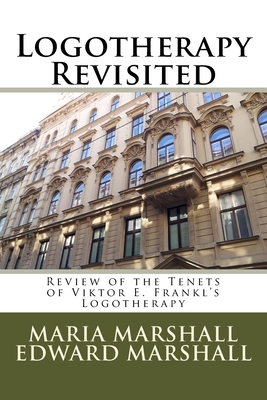 The writing of this book follows the ground-structure of the Doctoral Dissertation entitled "The Applications of Viktor E. Frankl's Logotherapy in Counselling Psychology," (1999) by Maria (Ungar) Marshall, at the University of Alberta, Edmonton, Canada, which contains a comprehensive overview of the fundamental elements of the philosophy and practice of Logotherapy, based on an extensive review of international literature. Edward Marshall co-authored the present book, adding the chapters corresponding to the Appendix, reflecting developments in the practice, study and research in Logotherapy, since the submission of the original Dissertation, to the present. This up-to-date, and comprehensive review allows the reader to find situations in everyday life and in professional activities, where Logotherapy can be usefully applied. Maria Marshall completed her Bachelor's Degree in Psychology with Honors at the University of Calgary, Alberta, Canada. She obtained her Master of Education Degree in Counseling and Human Development at Hardin-Simmons University, in Abilene, Texas, U.S.A., where she studied with Dr. Robert C. Barnes, President of the International Board of Directors of the Viktor Frankl Institute. She completed her Doctoral Degree in Counseling Psychology at the University of Alberta, Edmonton, Canada. Her Doctoral Dissertation was entitled "The Applications of Viktor E. Frankl's Logotherapy in Counseling Psychology." She completed her studies in Logotherapy with Dr. Elisabeth Lukas, Director of the South German Institute of Logotherapy, and earned the Diplomate Clinician in Logotherapy credential. She was awarded the "Statue of Responsibility" award by the Viktor Frankl Institute of Logotherapy. Edward Marshall completed his Medical Degree at the University of Navarra, Spain, and practiced Family Medicine in the Canary Islands, Spain. His Doctor in Medicine and Surgery (Ph.D. in Neuroscience) Degree is from the University of La Laguna, Spain. His Doctoral Dissertation focused on the neurophysiology of the visual system. He completed his residency in Psychiatry and earned his Post-graduate Diploma in Clinical Psychiatry at the University of Leeds, UK. He practiced as Psychiatrist at St. James' Psychiatric Hospital, Portsmouth, UK. Since moving to Canada, he has been practicing Psychotherapy. He completed the Diplomate Clinician in Logotherapy credential with the Viktor Frankl Institute of Logotherapy. Maria and Edward Marshall founded the Canadian Institute of Logotherapy, Ottawa, Ontario Canada.